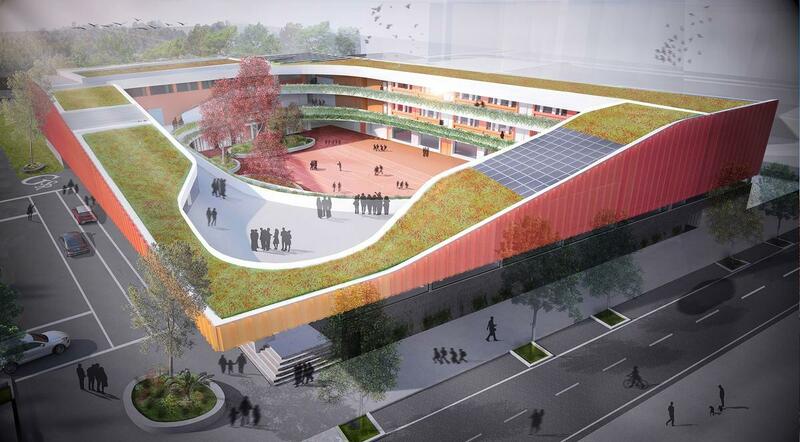 The design of the building largely meets the principles of bioclimatic design: This school is a remarkable building visible by all its facades and also by its green roof. The building is animated from the outside by a play of shadow and light with screen-printed glass breezes, a large mosaic facade houses the entrance of the school and with a spiral design. The vegetation remains among the assets of this project while choosing indigenous species, adapted to the local climate and low allergenic potential (according to the RNSA).The materials used are ecological whose characteristics are verified, the wholesale products are 100% local and have a life cycle analysis, the second works products are generally imported products with environmental characteristics (Environmental impacts) and health (VOC emission, antifungal and bactericidal characteristics) meeting the requirements of high environmental quality. The project site gave the example of the low-nuisance construction site by setting up a set of environmental monitoring actions thanks to the AMO HQE watch and green site manager, as well as the involvement of the companies of the works, the environmental will of the MOA was translated on site. According to the feasibility study of renewable energies on site, the solar energy remains the best adapted to the project, and the exploitation of this free source of energy is concretized by the installation of solar thermal collectors allowing to after covering more than 40% of the sanitary hot water needs of the pool, the installation of photovoltaic solar collectors has covered at least 10% of the school's electricity needs. In addition to the integration of renewable energy, the building resorts to meet energy and water needs for efficient systems. The heating and cooling of the various teaching rooms is done by a variable flow system to limit the consumption according to demand, as well as an air handling unit with heat recovery. The general lighting of the building is provided by LED luminaires with very low consumption compared to the reference (ASHRAE 2010), presence detectors are installed in all sanitary rooms and stairs. The elevators are economical type equipped with variable speed drives.In general, the energy efficiency has been well integrated in the building not only by the choice of equipment but also the choice of a high-performance envelope using materials that largely respond to seasonal variations in heat input and heat loss and by putting in place insulation. suitable thermal. A dynamic thermal simulation proves that the building can achieve primary energy gains of more than 35% compared to the local (RTCM) and international (ASHRAE) reference. The water requirement does not exceed the reference requirement (CSTB), a tank of 250 m3 of rainwater was installed at the level of the basement to meet the needs in watering, in addition, a coefficient of overall waterproofing of the building moves the 70% with an annual total infiltrated volume of 923 m3, a recycling 1232 m3 and only 111 m3 annually rejected to the network, consequently the building favors the natural cycle of water at the level of the zone of NAFA. And to monitor and rationalize energy and water consumption during school operation, energy meters (for HVAC, lighting and DHW), as well as water meters (for each station principal) have been put in place. The comfort of the occupants (students, faculty, administration, visitors ...) remains an essential concern for the client, visual comfort and better exploitation of the daylight were well proved by the building design, by the choice of materials reflecting and a rate of glazing (double glazing) supported, good hygrothermal comfort is achievable via sophisticated HVAC equipment using control means and centralized control is provided by room thermostats in all rooms to be air-conditioned and a CO2 detector for each study room.An acoustician was integrated into the project during the design and construction phases, and technical and architectural provisions were put in place to achieve a standardized level of sound insulation, a noise level of equipment, a noise level of shock ..., comply with the requirements in force as part of the high environmental quality approach for this project. The health of the occupants was a priority of the project owner, and the presence of an AMO HQE on the project facilitated the achievement of the health objectives of the project. Achieving good air quality inside the building using airflows that comply with EN 15 251 and ASHRAE 2010, and the configuration of air filters (G4, F7, F9 ... ) is well justified performing. The restoration areas are equipped with bactericidal and antifungal coatings and for other spaces, the chosen paints are low VOC (A +), these materials are easily cleaned. The project has been certified High environmental quality - design phase with EXCEPTIONAL level, and is expected to be certified HQE exceptional - phase execution, and he is likely to be a winner of the title "Green Award 2018 ".